A few months ago, I woke up in the morning with a headache so severe that I couldn't even bear to move my head. A couple of hours and a couple of painkillers later, the headache was still just as bad. The only way was to sleep it off but with my (naughty) daughter at home and no one to babysit her - the husband was travelling too - sleep was a little hard to come by. I put her in front of the telly telling her she could watch it for as long as she wanted to. I expected her to be glued to the telly but the moment she realised that she had a free rein to watch her favourite cartoons, she quickly lost interest in watching them. "Play with me", she said to me. "Why don't you fix some puzzles", I suggested. "And then you when you are done, you can have some chocolate". Yes, I was subtly bribing her to leave me alone for some more time. To her credit, she did manage to keep herself busy with the puzzles for a while and I gave her some chocolate as promised. "......I want chocolate chip muffins. You make some muffins now", she demanded. "Mama's head is aching", I explained to her. "Let me rest just a little while longer, then I'll have some tea and make you the muffins", I told her. She nodded and went off to her room. I could hear toys being scattered and then the sound of a tap gushing and braced myself for a major clean up operation later in the day. Moments later, she was standing next to me, her toy teacup filled to the brim with water in one hand and a tube of Euky bearub in the other. "Mama will drink the tea and put the balm and she will become alright and then we can make the muffins", she proclaimed confidently. Anything for such an adorable caregiver! I headed straight to the kitchen and started to fix her some muffins right away. Some days remain etched in memory forever. I don't think I can never ever forget the sight of my little girl helping me to make the muffins that day. I measured out the dry ingredients and she whisked them together. Then she poured out the wet ingredients and I mixed everything together to get the batter ready. 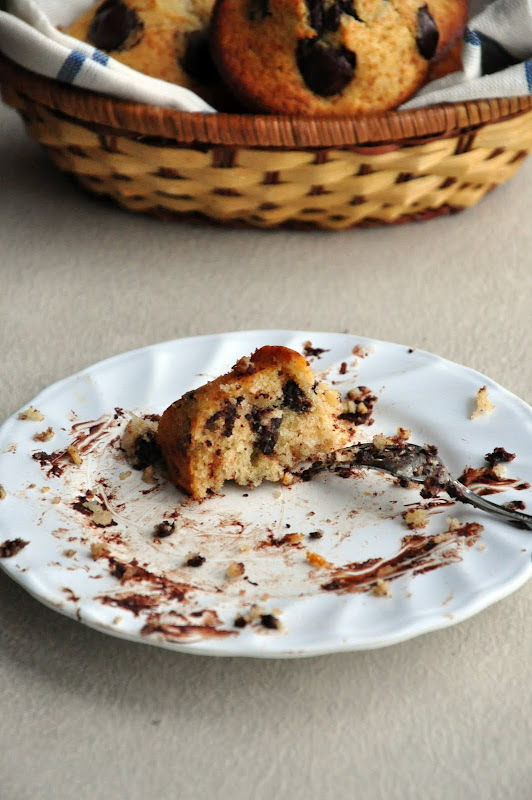 I spooned it out into the muffin tray and she sprinkled the chocolate chips on top. In no time, the aroma of freshly baked muffins wafted through the house. These muffins are very very quick and easy to make. I have stayed true to the original recipe from Joy of Baking except for a very minor change - instead of sprinkling the cinnamon on top, I mix it into the batter. A very small change but one that makes a significant improvement to the taste. 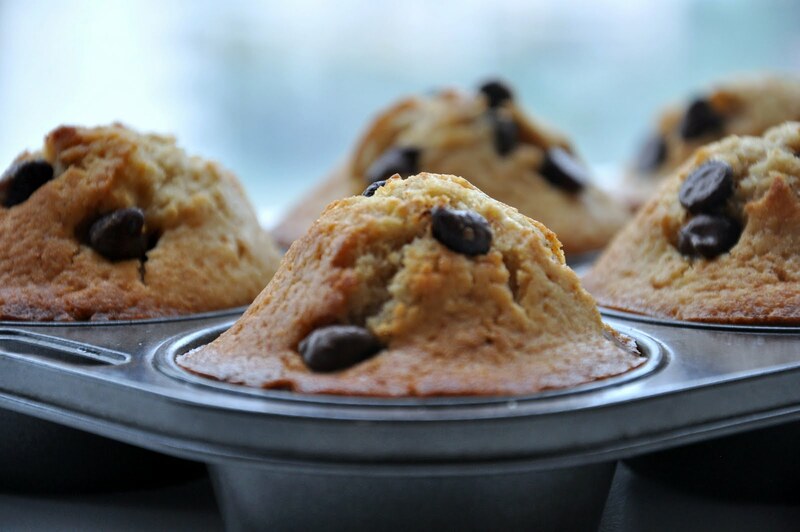 Pre-heat the oven to 190 deg C/ 375 deg F. Grease a muffin pan with butter or baking spray. Whisk together all the dry ingredients. Reserve a tbsp of the chocolate chips and toss the the rest into the dry ingredients. Melt the butter and let it cool completely but don't let it set again. Whisk together the cooled melted butter, milk, egg and the vanilla essence. Fold this mixture into the dry ingredients, stirring until the ingredients are just combined. Spoon into the prepared muffin pan. 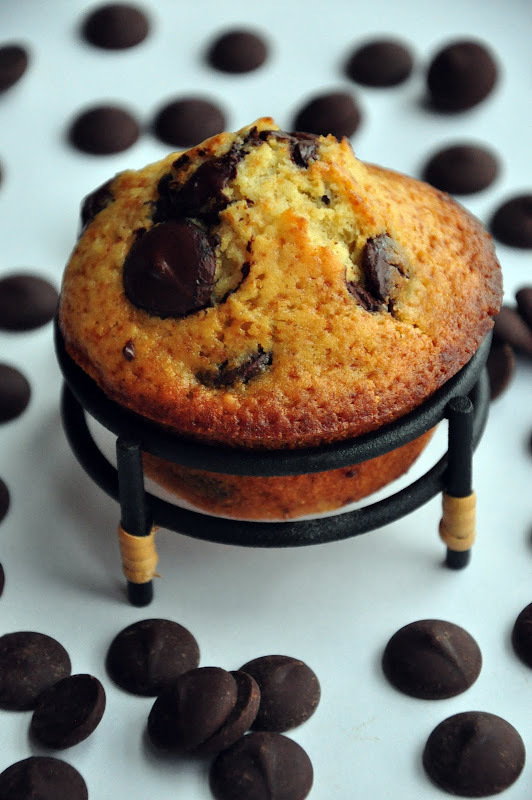 Sprinkle the reserved chocolate chips on top and bake for about 20 minutes or until a toothpick inserted in the centre of the muffin comes out clean. Incredibly moist and with a delicate crumb, these muffins are best eaten on the day they are made and best served a little warm. I prefer them with bittersweet chocolate chips, but they are slightly bigger and don't look as nice as ones with the semi sweet chocolate chips. You could also make them with oil, they are a little more denser when made with oil but are definitely more healthier and just as tasty. Your daughter is so adorable and caring. Please tell her that we loved her muffins. Kids love baking, those muffins are adorable... She will be proud when she will read this post! I love the small stand, is that ur daughter tea set? Chocolate is my fave..I can gobble few muffins now!! Scrumptious muffins..cute stand, kids love helping especially for baking.. I guess your headache must have vanished in the process...kids are unpredictable at times na..so cute of her to help you. delicious muffins. BTw, I have referred your blog in my back to blogging post. Great post!! Love the muffins!! I have a headache now, I wonder if I should make muffins or take Excedrin. Those muffins look great. Priyanka, so what did you bake? Radhika, she is delighted that you liked her muffins! Cham, Sanjeeta and Priya: That stand is actually a candlestand, the muffin just happened to fit so neatly into it! Sumi, you said it, kids can be devils one moment and angels the other! And thanks a lot for the mention. But more than that I am truly glad that those posts helped you. Sanyukta, Priya, Ramya, Apu and Nithya thank you for visiting and your appreciation! so cute of your daughter!..muffins look great! The muffins look delicious. Bet you forgot about your headache when you saw your lovely daughters happy face.